In over twenty years of painting Warhammer miniatures of all shapes and sizes, I, for one reason or another, had never entered their annual Armies on Parade contests. I decided to put that right this year! I had originally intended to do a display board for my Death Guard army. Unfortunately the 40k display day clashes with Blizzcon next Saturday, so I had to go with something else. After a little thought I decided to do something with the Kharadon force I completed earlier in the year. 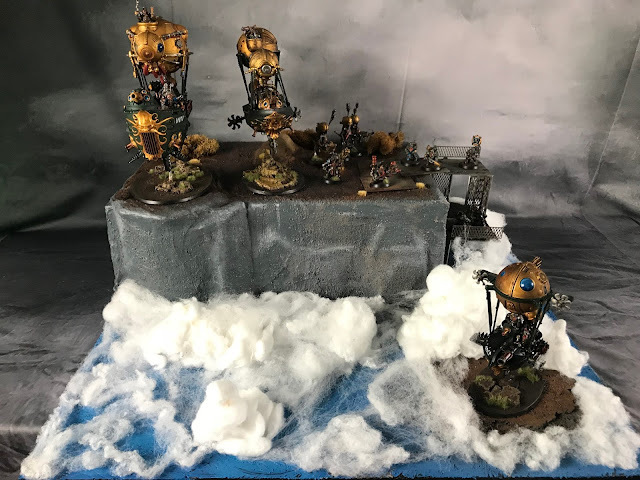 Given that they are an army built around Steampunkish Dwarven airships I wanted to go for something that suggested they were high up above the clouds. The idea was to build a cliff structure, and have the fleet kind of docking there. However I have never built anything at this scale, so this one caused more than a little anxiety as I worked on the build. I used some old boxes as a base and wrapped it in plaster to create the rough shape, weaving in some cork board underneath it to create some degree of depth, so it just wasn't a flat square. That didn't quite work as well as I thought it would, and at last minute I ended up building out an extra protrusion on the left hand side to try to make it look less 'boxy'. I think I just about got away with it. Next time I think I'll use something more malleable as a base, probably some hard foam, so that I can sculpt more realistically shaped base terrain. Still I learnt a lot about how to operate at this scale, and the final result wasn't too bad. That final last minute addition of the cliff to the left made all the difference visually. I used landscaping sand and stucco to give the rock and dirt some much needed texture as I undercoated it. Then I worked up the clouds using a combination of shredded cotton balls, and the 'spiderweb' Halloween decoration materials. It at least meant that you had two textures going on. The cotton balls for the more voluminous areas, and a more wispy effect with the spiderweb. I think the decision to put the smaller of the ships down below worked out well. Added a more interested 'composition' as it were, and making it look like it was bursting through the clouds. So overall, it was an interesting learning curve. I feel I'll make something even more impressive next time out. I wasn't unhappy with this one, but it never quite reached the level I had in my mind's eye when I started, but I guess such is the way with creating art of any kind! I did pick up the prize at my local store (albeit with a limited field as some entrants didn't make it to the event), but the fun was very much in the building on this one. Next up will be finishing up some more of the Death Guard, as I prepare to take it to the Las Vegas Open in January.